$12.95 (save $4.00). Once it sells, it's gone. We do not expect to restock. 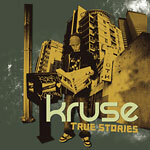 Tales of struggle, frustrations, and everyday livin', MC/Producer Kruse returns with some breezy summer beats and a little help from friends like Luckyiam, Himself, Pigeon John, Eligh and Sunspot Jonz. While his Raw Materials EP gave you a glimpse into Kruse the MC, his newest full length finds him both lyrically and musically on the up and up.